← Turn over day after the hull is finished. I have been spending several weeks working on the internal hull finish. Several more weeks to go I believe until I am satisfied with the internal hull finish. 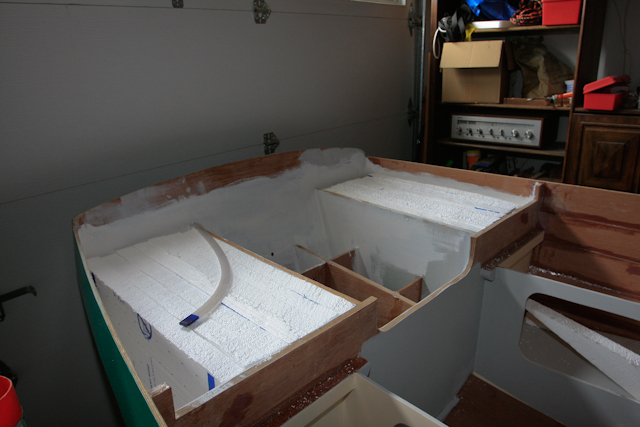 All the buoyancy tanks have been filled with Expanded polystyrene sheets cut to shape and fitted. As the designer states in the plans, “not expensive, but disaggregates easily”. Have a vac close at hand and use regularly while cutting your sheets.